Momofuku Milk Bar is known for its crack pie, compost cookies and cereal-milk-flavored soft-serve ice cream, but to my mind, the best thing you can get at the Milk Bar is the corn cookie. 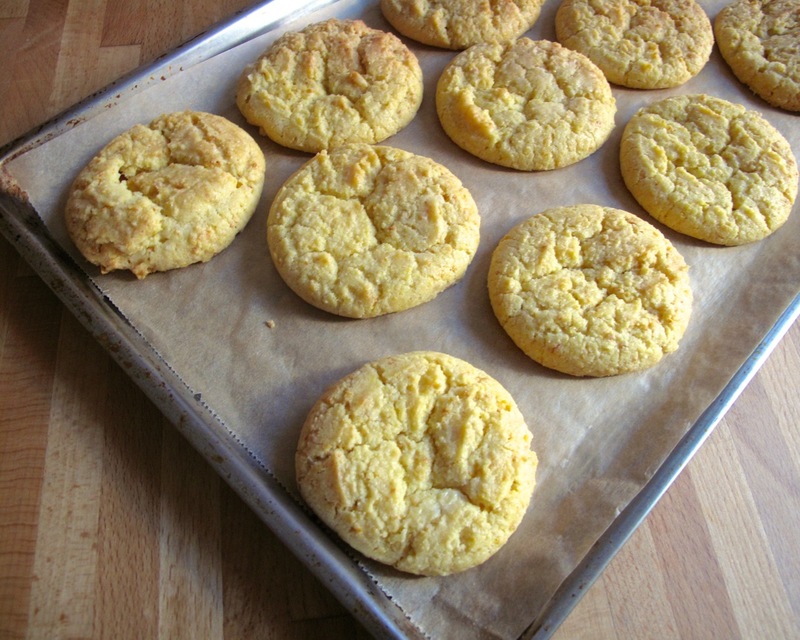 Ever since I first tasted a corn cookie, I have wanted to make them myself. Last winter, Momofuku's pastry chef, Christina Tosi shared the recipe in both her cookbook and Volume 2 of Lucky Peach. It took me nearly a year to get around to making them, but yesterday I finally did. The results weren't exactly like the cookie perfection that you can buy at Momofuku, but they were pretty darn good. 3. Take the speed down to low and add the dry ingredients. Mix the dough until it just comes together, and for no longer than 60 seconds. Don't over mix. Scrape down sides with a spatula. 4. Use a 2 3/4 oz. ice cream scoop (this is your basic-medium-sized scooper), portion out cookie dough onto a parchment-lined baking sheet, about 3 inches apart. Wrap the pan tightly with plastic wrap and refrigerate for a minimum of 1 hour and up to one week. DO NOT BAKE your cookies form room temperature. When you make a cookie with this much butter, you want it to be super-cold before you put it in the oven. 5. Heat oven to 350°F. Bake each batch for 18 minutes. The cookies will spread, puff up and crackle while in the oven. After 18 minutes they cookies should be faintly browned at the endues, but still bright yellow in the center. Give them an extra minute if that's not the case. 6. Cool the cookies on the sheet pan before transferring to an airtight container for storage. The dining table is so nice and has a leaf that expands the table to be quite large. We hosted many, many wonderful dinners at this table.